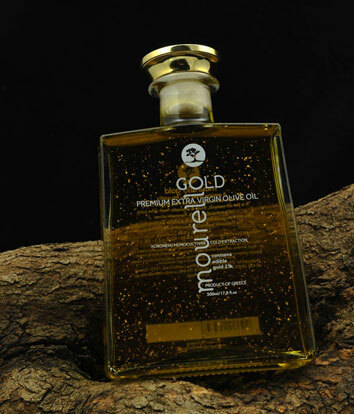 A new product that has received innovation awards is the olive oil with an admixture of edible gold. Does it have healing properties? What does its presense add to products? Gold is historically known for its healing and cosmetic properties. Queen Cleopatra of Egypt is the first known person to use a facial mask of gold while sleeping every night in order to retain the forever young complexion she was famous for. In Ancient Rome gold balms were used for various skin healing therapies while in ancient China the empresses of the Qing (Ch'ing) Dynasty used it for facial treatments. Later on, various peoples, e.g. Czars of Russia, used edible gold in food and delicacies as a germ and toxin collector. In certain Asian countries edible gold is added to fruits, snacks, coffee and tea. Since at least 1500 a.c. edible gold leafs were added in Europe to liquor bottles like the Danziger Goldwasser and Goldschlaeger. Some native Americans believed that gold consumption could allow people to float. Reaching today which shows that the precious metal has antioxidant properties that help cell regeneration and mental well-being. It enters the human body through the substance of PGA whose strong moisturizing formula retains moisture for a youthful skin preventing premature ageing. To conclude, the combination of Cretan olive oil and thyme honey enriched with flakes of edible gold creates an elixir of youth and mental wellness.